The most important aspect of constructing a website is compatibility. As a business owner, you will need a website that meets your online marketing and sales objectives. Your website must also deliver in ease of use and high functionality to address the needs of your clients. 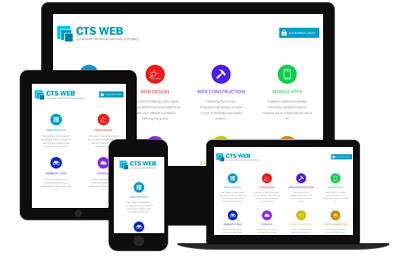 The experienced web construction team at CTSWeb – Cavalier Technical Services (CTS) will help you in selecting the best programming solution for your website and create compatibility that is expected. A poorly constructed website can significantly affect the volume of online business you are able to achieve. When a website does not function the way it ought to and is not compatible with mobile devices, browsers and loads slow, your business stands the risk of losing potential clients. We understand that the risk of losing a potential client can be expensive. This is a risk we can help you mitigate with the proper construction techniques from an expert team of programmers. Our goal at CTSweb is to work with you to deliver a website that meets all your expectations. We are committed to creating an outstanding product that is a reflection of your brand and will operate to deliver high levels of online performance. With years of experience, we know we possess the tools and human resource to provide you with high quality service and result oriented websites. The secret to our ability and success in building solid websites for our clients, lie in the human capital that we possess at CTS. Our staff is made up of designers, programmer, and database engineers, whose combined years of experience and in-depth knowledge is the recipe for creating a professional website in the shortest possible time. Working to meet your business needs, our team will help you select the best programming solution for your site and build you an outstanding product. Unlike many other web programming companies, we want to provide a comprehensive website creation service. With this in mind, we have created a web construction team that includes a stable of photographers and videographers, who will produce high quality images of your products and locations, professionally executed video testimonials or demonstrations, all in an effort to improve the overall design of your site. and ensure compatibility with an ever-growing array of devices. Ask about our extensive portfolio of work and see how we can construct a website that will meet all your expectations.